More commuters are choosing to use public transit or walk instead of driving alone, says a new survey by the Downtown Seattle Association. 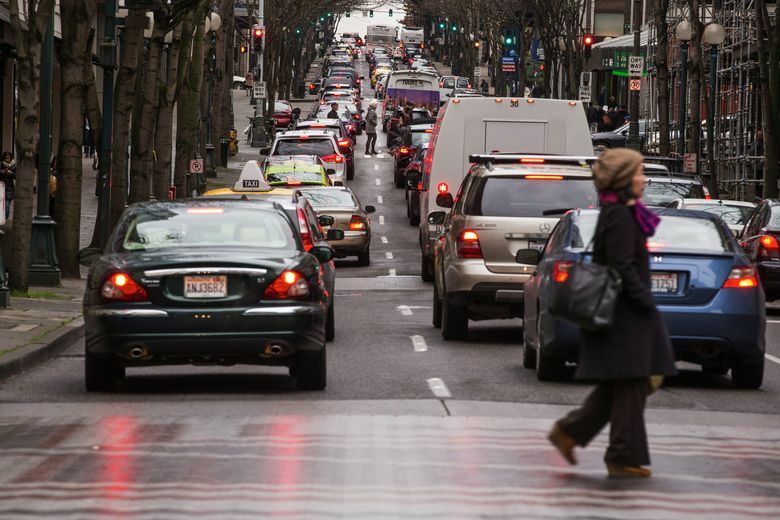 Of the nearly quarter-million people who commute to work in central Seattle, a full 69 percent arrive by means other than driving alone, a new survey shows. The trend illustrates how the city is keeping pace with rapid growth without adding motor vehicles — through transit, walking, downtown living and bicycling, said Scott Kubly, city transportation director. Van pools and walk-on ferry riders also contribute. “The sheer number of cars staying flat, is a powerful story,” he said. The Downtown Seattle Association released its findings Wednesday morning. Last year’s solo-driving rate of 31 percent represents a steady decline from near 50 percent in 2000, and 34 percent two years ago, said Jessica Szelag, executive director of the DSA-affiliated nonprofit Commute Seattle. These numbers represent an average from Lake Union to Safeco Field, and from Elliott Bay to Broadway. 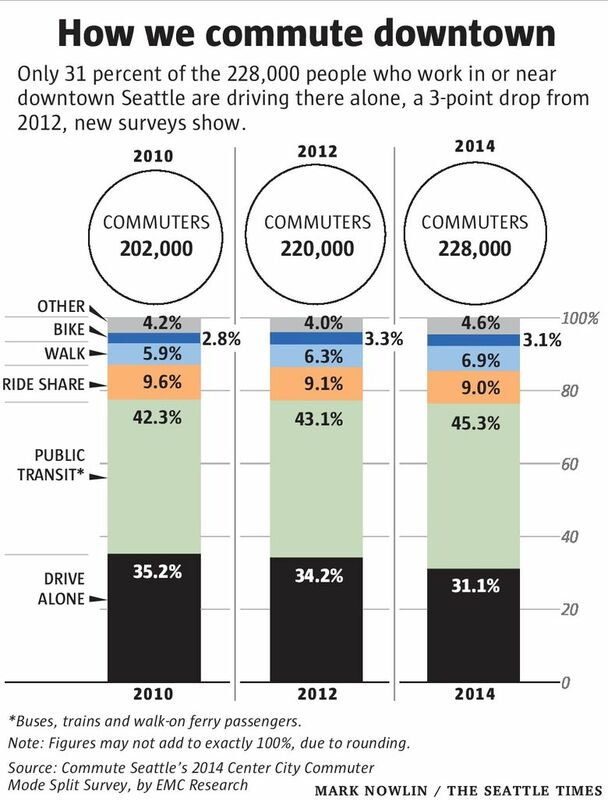 Solo-car commuting varies from 53 percent at Uptown (Lower Queen Anne) to 23 percent in the city’s retail and financial core. Though it’s just a survey, the biennial report is constantly invoked by transportation leaders as the philosophical basis for changing the pecking order on city streets. As car driving wanes in priority for city planners, it becomes increasingly frustrating for motorists. Many were irritated by the new left-turn signals and loading zones along the new Second Avenue bikeway last year. Years of Mercer Street construction have caused gridlock. And more recently, drivers risk a $124 citation in the Bell Street “woonerf” — a pedestrian-friendly stretch where cars may travel no more than one block. On-street parking is more scarce and more expensive than five years ago. But business and environmental groups say it’s impossible to sustain downtown growth by adding cars. Kubly said there’s an urgent need to build transit ridership in booming South Lake Union, where some 46 percent of workers drive to work alone. Streets could become impassable within a couple years, when the first two 38-story towers of Amazon’s Rufus 2.0 campus are finished south of clogged Denny Way. Just north of Denny, five residential towers of 29 to 40 stories are proposed between Westlake and Fairview avenues. The DSA’s strategy isn’t entirely about coaxing drivers out of their cars. During the association’s State of Downtown Economic Forum breakfast Wednesday, attended by 1,000 people, a company called Parkt unveiled a phone app to attract drivers to shop downtown. They might park in a garage, then get discounts on parking fees — for instance, maybe a $4 credit for buying $150 worth of clothes. It’s like a paper validation ticket, but using QR codes and software. Even former Mayor Mike McGinn, who frequently bicycled to City Hall from Greenwood,found $2.5 million in city funds to install a network of “e-Park” signs that show available garage spaces, collaborating with DSA in 2010. 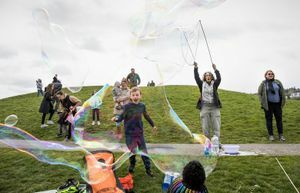 With a population of 652,000, Seattle is the fastest-growing large U.S. city, and in recent years surpassed Boston, Washington, D.C., and Baltimore in growth. While the percentage of solo commuters in central Seattle dropped 3 points, overall traffic and congestion stayed the same as in 2012, Commute Seattle said. State highway counts show that driving and bus times from the suburbs have worsened — to the point where motorists from Everett must allow 80 minutes to consistently reach downtown Seattle on time in the morning. Cars remain king in the broader Puget Sound region. Census surveys last year found 70 percent of employees drive alone, 10 percent carpool or van pool, 9 percent use transit, 4 percent walk and 5 percent work at home in Kitsap, Snohomish, King and Pierce counties combined, says the Puget Sound Regional Council. Even as officials extol the virtues of transit, 25,000 bus passengers will be subjected to delays next month when the state temporarily closes the Aurora Avenue North bus lanes to install electronic message signs for the Highway 99 tunnel project. King County Metro Transit will send extra buses to relieve Aurora crowding, said General Manager Kevin Desmond. Metro deployed similar relief buses on the RapidRide C Line in West Seattle, during its 2012-13 launch. Kubly said Monday he hopes state managers can shorten what might be a 12-week pinch on Aurora. However, Desmond said he doesn’t believe spring slowdowns on Aurora would hinder transit growth long term.